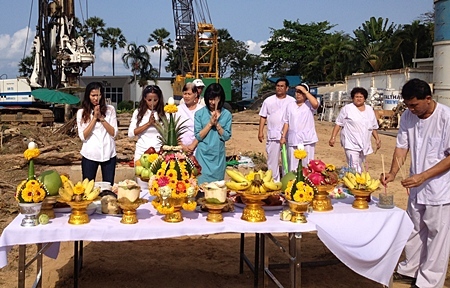 The Palm Wongamat Beach recently organised a spiritual blessing ceremony of their land located at the end of Soi 16 Wongamat by inviting a selected team of spiritual people to help bring good spirits to their project before construction begins. In traditional style, the spouses of the owners (l-r) Vipharat Fineman, Sukanya Gale and Kazuko Kasemsri Na Ayudhaya were asked to pray to welcome these good spirits in to the project and guard over it. ItalThai Trevi cranes and heavy plant gear was standing by to begin pre-construction preparations which are now completed. The Palm aims to complete construction of their stunning 46 and 26 story towers in 36 months time and once completed promises to become one of the most desirable condominium addresses in Pattaya.